Racer is a fun racing game, but it doesn't feel complete. It has good graphics , although it really needs alpha blending and anti-aliasing, but it has poor performance, even on a top-of-the-range computer. The sound is good, but the music is a bit annoying. The download would actually be at least half of its current size if Racer didn't come with the movie that doesn't seem to even play regardless of the OS and the game's settings, and over four megabytes of annoying music. The gameplay of this game is heavily flawed. The game's physics are completely unrealistic, the AI cheats, a lot of the game isn't translated, and you can't even complete the game, since you can't go from 'D cup' to 'C cup'. Collisions with other cars are hardly natural, and because of this, overtaking opponents is pretty-much impossible unless your car is a lot faster than their ones, or a shortcut is nearby. If your car touches the edge of the road -- which is nearly impossible to avoid in a single race -- then you will usually at least halve your current speed. 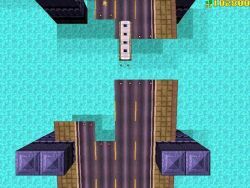 The computer players never touch the edge of the road -- although they are always on the inside of every corner -- unless they are pushed off, which is very hard to do because of the game's flawed physics engine. When they touch the edge of the road, however, they don't slow down. They will, however, seldom slowdown when you push them completely off-road, which is almost impossible and will almost guarantee that you will lose all your speed. A large portion of the game is untranslated, and it appears that you cannot complete the Class D, so you will never be able to use the half-decent cars in the 'Career' mode. If the game's author would take the time to fix up the physics, translate the rest of the game, make the A.I. actually resemble intelligence rather than cheating, make the controls half decent (preferably with analogue steering) and make it optional to include music and the video that can't be played with the download, then the game would be "Excellent". 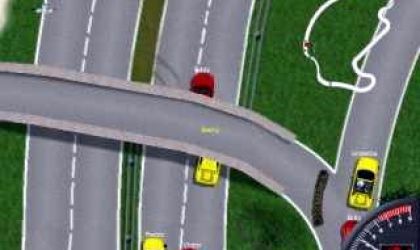 Racer is one of those games that almost everyone enjoys playing. You buy your car and keep racing it until you get enough money to upgrade your current car or purchase a new one. 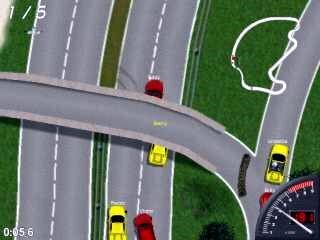 You will also need money to unlock some of the race tracks. There are 7 different tracks to race on, some of these are night time races and some day time. 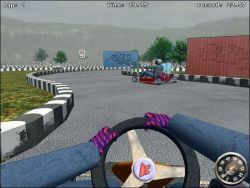 Racer contains loads of different cars to choose from. Just a few of these include the Ford Focus, Dodge Viper, Renault Megane, BMW Z3, Audi A6, Audi TT and many more. Like all these types of games it can be hard in the beginning because you can only afford the cheapest cars and all the other players have better ones, but if you race well, soon you will be driving something like the Dodge Viper or Audi TT. One nice feature is the training option which lets you race any of the cars so you can atleast try out the faster ones if you never manage to get there in Career mode. 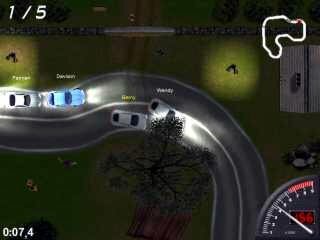 Racer supports some decent graphics and sounds with good gameplay and overall is a very well made game. An added bonus is the ability to ride over people that run across the track and watch them get squashed. It's nice game buying and selling cars but as another review said when you go off the track it slows down so much and opponents can pass you so easily that it is too late to catch them. Acceleration is another problem too! But still its good to play. Very good cars, very good graphics, I just can't move from Class D. Please tell me how to win! Its major problem is that it isn't fast enough. It pretty much stays at one speed. It's okay but kind of hard. You slow down too much if you go off the track. Boring racing game. Slows down too much when it gets off the track.